The following was written by Alice Harrison, Communications and Advocacy Coordinator, and Leah Good, Programme Officer, for Transparency International’s Climate Governance Integrity Programme. 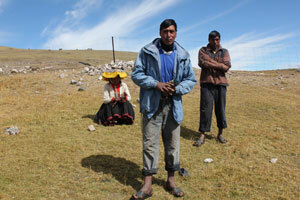 The Huilca family are having to adapt to the adverse effects of climate change in the Peruvian Andes. See more photos below. The Huilca family’s plot of land is a stark green anomaly on an otherwise arid mountainside. As we survey this small vestige of fertility from above, Porfirio Huilca points to its lifeline; a man-made stream that furls its way downhill from a natural spring four kilometres away. Porfirio and his brother Mario spent a year carving this shallow duct into the ground, deftly negotiating the lay of the land so that gravity would do the rest. Until relatively recently the grass here survived unaided. The Ausangate, the glacier that crests this Andean mountain range, is ceding to global warming at an alarming rate. As the ice evaporates the surrounding land is drying up. Each year the Huilca family have had to toil longer and harder for ever decreasing harvests. The impact of climate change, in a country that is responsible for only 0.4% of global emissions, is felt first and hardest by Peru’s rural poor. In the past 25 years, Peruvian glaciers have reduced by 30%, imperilling the delicately balanced ecosystem of the Andean region, and killing off crops, livestock and livelihoods. The Huilca brothers’ survival tactics are being sponsored by a local NGO, which in turn relies on international funding. So far 46.7 million dollars in public climate finance has made its way to Peru, with commitments from the Peruvian government to significantly bolster that sum. Our chapter in Peru, Proética, is working to ensure that that money gets to where it’s needed. The risks are significant. Peru has historically suffered high levels of corruption, and currently sits towards the more worrisome end of our Corruption Perceptions Index, alongside Greece, Thailand and Colombia with a score of 3.4 out of 10. Proética’s recent national survey posits corruption as the country’s principle impediment to development. More than half of people surveyed named it as the number one reason that social programmes fail. Mario and Porfirio belong to a sizeable demographic whose livelihoods rest upon the integrity of the politicians, businessmen and NGO workers who are entrusted with climate money. If it is lost to embezzlement, kickbacks or cronyism, Peru’s indigenous population will lack the resources they need to guard themselves against our increasingly erratic and extreme climate. We could see large-scale strains on food and water, increased conflicts over resources, and mass migration to Peru’s already burgeoning urban areas. But it’s too late to be pessimistic. There are steps to be taken now to forego this fate. This begins with industrialised nations delivering on their climate finance pledges; their debt for decades of obstinately unfettered pollution. That money must then be monitored at each step from donor coffers to projects on the ground. This means subjecting it to full public disclosure and systematic third-party verification, and providing complaints mechanisms for people to speak out when something doesn’t add up. In this hyper-digital age, it is easy to become complacent about the accessibility of information. Proética are trying to follow the course that climate money takes once it arrives in Peru, but often the trail will end abruptly, with no indication as to where funds were invested or who directed them there. In the absence of strong and enforced access to information provisions even the most inquisitive or enterprising of people might never discover what goes on behind the closed doors of duty-bearers. Corruption flourishes best when it is kept in the dark. So we need to turn on the lights. Climate finance is tax payers’ money, meaning that we have a right to know how it is spent and why. Sometimes we must exercise that right on behalf of those who can’t so easily. From the snow-capped heights of the Andes calls for increased accountability may seem abstruse, but for Porfirio and his family they could prove a lifeline.